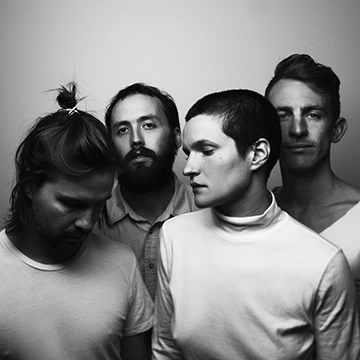 The trails that Brooklyn’s Big Thief — Adrianne Lenker (guitar, vocals), Buck Meek (guitar), Max Oleartchik (bass), and James Krivchenia (drums) — take us down on Capacity are overgrown with a wilderness of souls. Their highly anticipated second record will be released on June 9th by Saddle Creek. These are carnivorous stories, with pangs of sadness and joy. Lenker shows us the gentle side of being ripped open, and then recounts the second act of pulling oneself back together to prepare for it all to happen again. Capacity comes just one year after the stunning debut of Masterpiece. The album took them on near-constant tours coast-to-coast in the U.S., to the U.K. and Europe twice, and around the world to Australia. But before leaving on their global adventures, they recorded Capacity in a snowy winter nest in upstate New York at Outlier Studio with producer Andrew Sarlo, who also produced Masterpiece. Sarlo worked intimately with the band to arrange most of the songs for the first time at the studio, moving from conception to birth in a matter of hours. Bonfires were built each night, a month of meals were prepared and shared by the five, with maple water from a tree tap each morning, everyone helping feed the sheep, chickens, and angora rabbits on the farm.
" ‘Mythological Beauty’ reveals the origin of the scar on the right side of my head,” says Lenker. “It is a conversation between parent and child; between child and child; between the child within the parent and the child within the child; and between the parent within the child and the parent within the parent."